Sometimes I decide to try a recipe and go through the cabinets and fridge and make sure I have everything or make a grocery list so I get the exact ingredients. Sometimes I look up a bunch of similar recipes and combine them or take inspiration from them all. Other days I really want to stick with a recipe, but end up using what I have on hand and hope it works. I found a Rick Bayless recipe for a salsa verde pizza. I read it over a half dozen times and was pretty sure I could do this by the book. I did, however, forget to check the salsa recipe until I was ready to go and realized it used a jarred sauce. I also didn’t have the correct cheeses on hand (go figure) or, apparently, the correct type of beer. Well, Bob had beer so I asked if I could use some of his fancy beer for the recipe. First things first, I had to get both the dough and the sauce going. 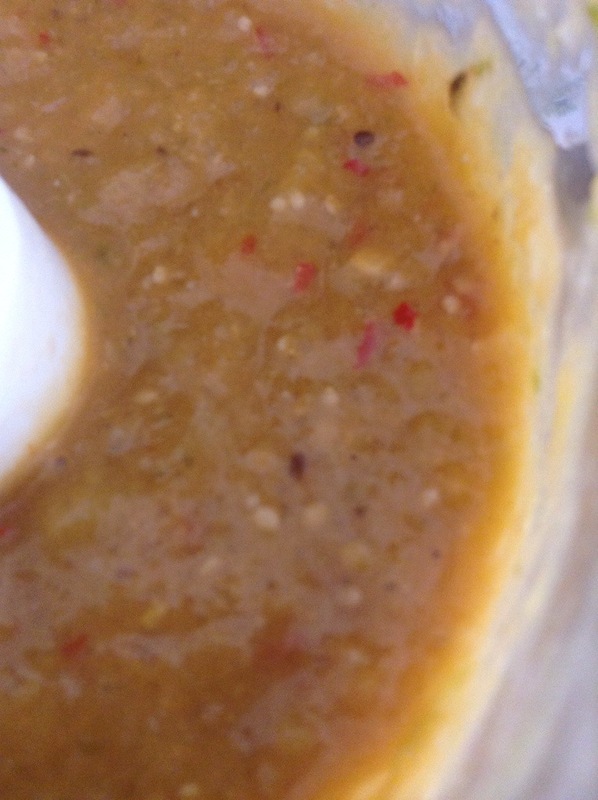 A friend from work gave me a bunch of fresh tomatillos at the end of the school year so I was good to make the sauce. 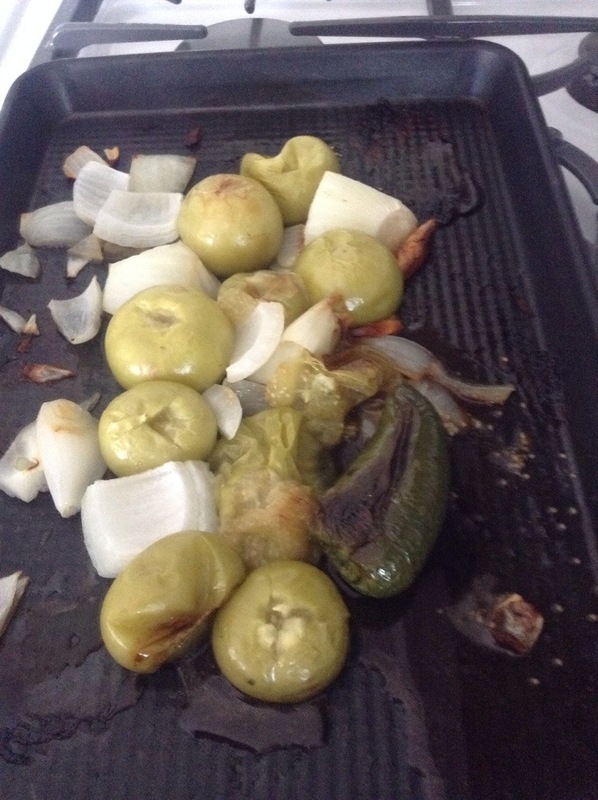 I roasted about ten tomatillos with a half an onion (large onion), three cloves of garlic and one jalapeño. I fully admit to generally being lazy with salsa, but with this I was careful to take the stems out of the tomatillos and the jalapeño before roasting. After everything cooled I dumped it all (drippings and all) into a food processor with some salt, cumin and chili paste. The color is no where near the pretty green salsa verde usually is, but all the taste is there. The tang and tart bite of the tomatillos, the slight sweetness of the onion and garlic all come through. Sauce done and good; on to the dough. Bob called this the world’s most expensive pizza dough. I needed a third of a cup of beer and used one of his fancy beers. 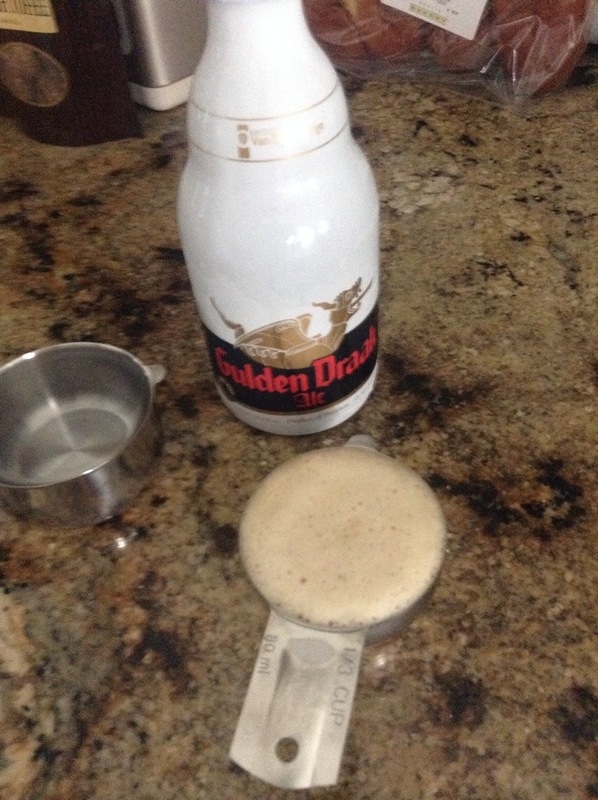 I was able to reseal the bottle so he had the rest with dinner, so no beer was wasted in the making of the dough. 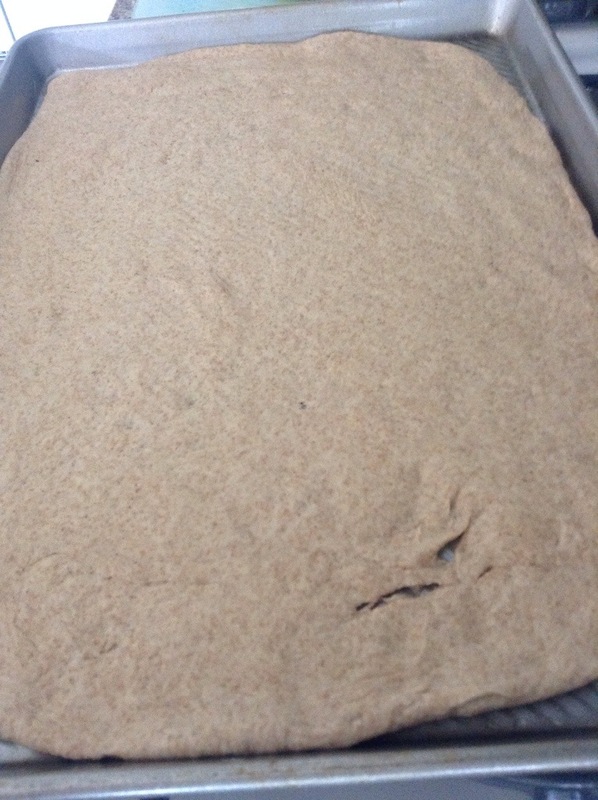 In keeping with my “let’s just change everything” mode, I swapped half the all purpose flour for whole wheat flour and increased the yeast a little. 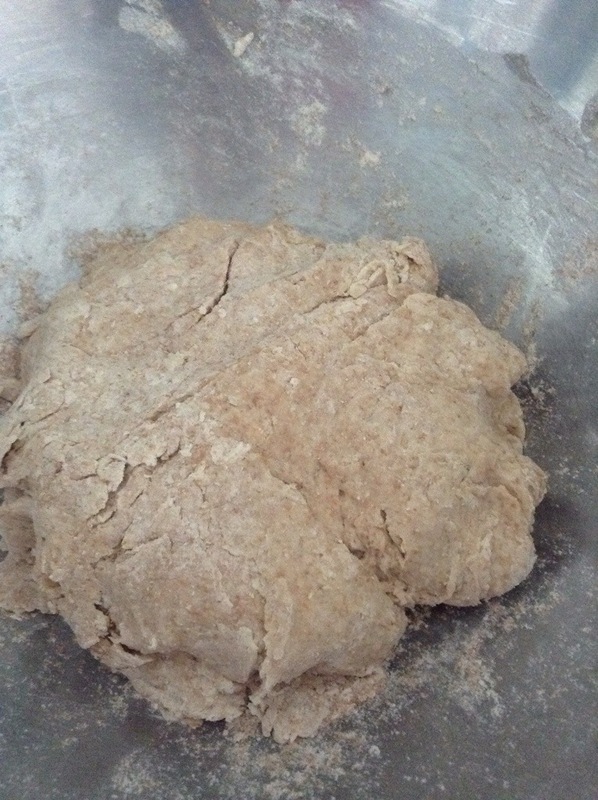 It was crumbly and messy and did not look anything like dough, but seven hours later – I had dough. 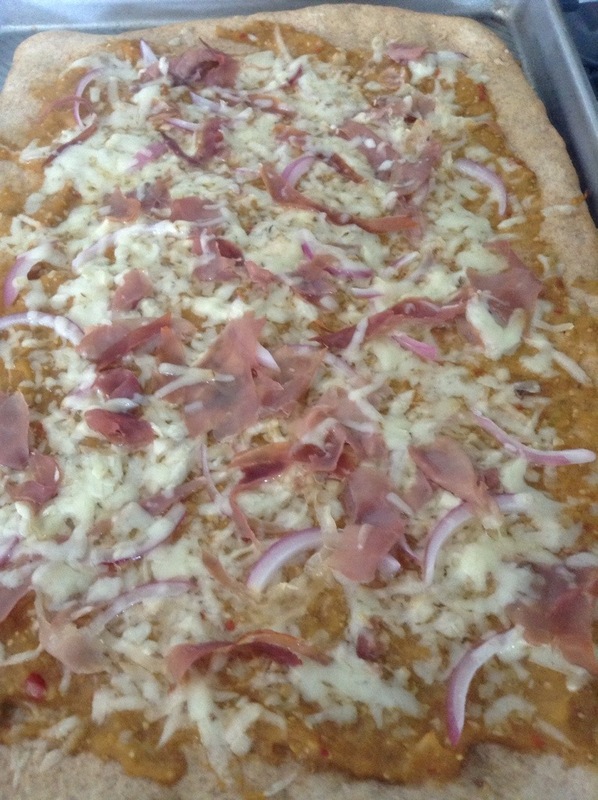 So the “pizza.” I rolled out the dough on an oiled pan and baked it at 450 for fifteen minutes. I know the recipe calls for 500, but I know my oven. 500 I have a burned mess in ten minutes; 450 I have crust in fifteen. While the crust was baking, I went for toppings. The original recipe calls for goat cheese and Parmesan and I didn’t exactly have those. I had Midnight Moon, which is technically a goat cheese, although not a soft cheese. I also had some fontanelle from last month’s box and Alpha Tolman from this month’s box. 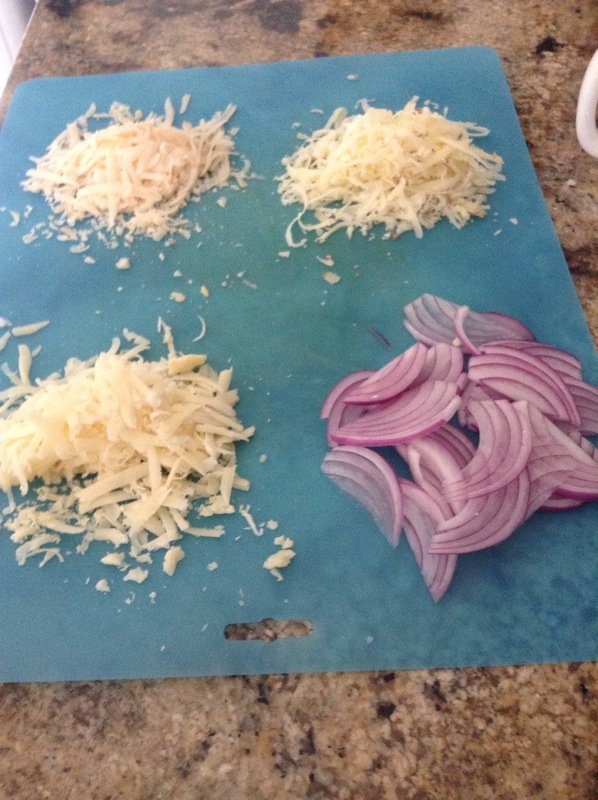 I used about two ounces of each plus about half of the sliced red onions shown and about an once and a half of prosciutto. Once the crust was baked for the fifteen minutes I added the sauce (about half of what I made) then the Midnight Moon. 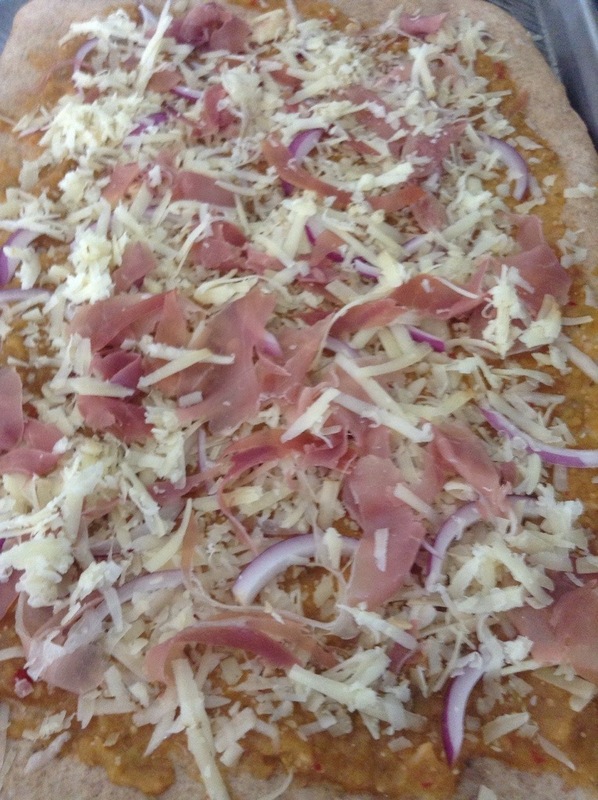 To that I scattered the onions then layered on the fontanelle only to top that with the prosciutto and the Alpha Tolman. I thought the layering was a good method for even distribution of topping and just made it look prettier. The dough went back into the oven for five minutes then, after checking the bottom of the crust to make sure it wasn’t burning, I left it in the oven (turned off) until Bob got home a few minutes later. At first Bob declared it “interesting.” Since he kept eating I figured it was good; I liked it. I liked it a lot. Bob said he liked the crust (although he did suggest picking up a few bottles of “cooking beer” for the next time). He loved the way the flavors came together but also said it was blasphemy to call it pizza. It was good, but he doesn’t consider it pizza. I can live with that. This will also probably be impossible to recreate because of the sauce. I know how I made it (see recipe below) but to get the right mix of the right ingredients when I don’t measure and am far from precise is going to be next to impossible. But I can try because pizza or not, this was just a darn good dinner. 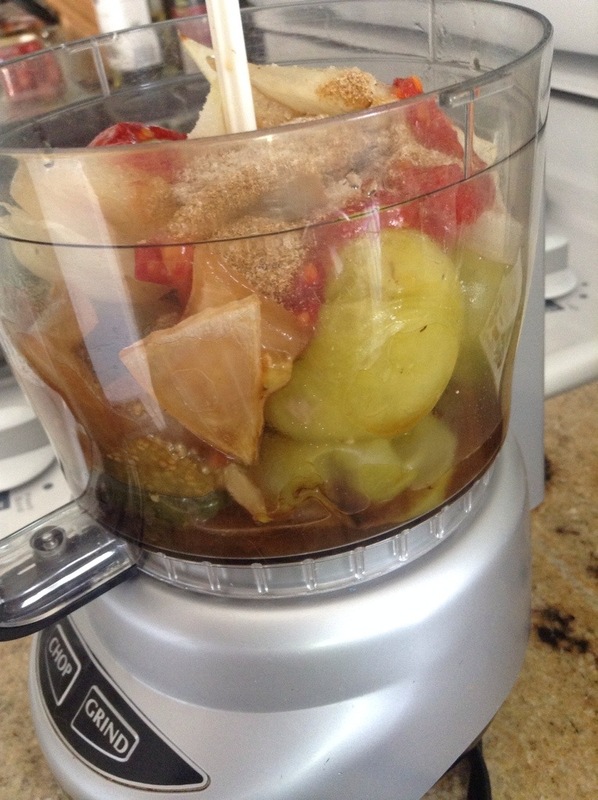 Chop onion into large chunks; de-stem the tomatillos and jalapeño. Coat onion, tomatillos and garlic in a little oil and roast at 400 degrees for twenty to thirty minutes, stirring once. Once cooled, pour everything into a food processor and add about a quarter teaspoon salt, 1 tablespoon chili paste and 1 teaspoon ground cumin. Blend well until smooth.